The Meditub 2646 walk-in bathtub features a 26×46 compact, free-standing design, which gives users an option of placing it into an existing bathtub opening or placing the walk-in tub anywhere in the room. Side-covering access panels are easy to add or remove. Triple Gel; Coat Fiberglass construction turns this compact walk-in bathtub into a powerful, long-lasting bathing unit that will help users feel safe while bathing or showering. For more information about fiberglass walk-in tubs construction, please refer to our Acrylic vs. Fiberglass article. The 26×46 comes with standard walk-in tub options: air bubble massage system, hydrotherapy, chromatherapy, and aromathereapy. Air bubble massage system consists of a tee heater that maintains the temperature consistency and symmetrically allocated (a_jet) air jets that provide the spa-like air bubble massage experience. Hydro system consists of fully-adjustable and directional (h_jet) water jets. The water pressure and direction can be adjusted individually. 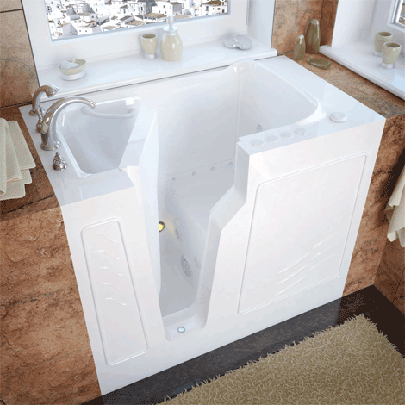 Dual system 26×46 walk in tubs combine air massage and hydrotherapy systems into one. Deluxe Hydro Massage System includes a one horse power pump with directional water jets. The whirlpool massage system includes (h_jet) 360° color matched, directional and adjustable water jets. Each individual water jet is also fully adjustable as far as pressure or velocity of water also included is a FREE Inline Heater which maintains a consistent water temperature, rated at 15 Amps 125 Volts AC, 1 Nema Plug. massage jets and is adjustable up to three speeds. Air system is assembled with self cleaning feature also includes a free 300 watt Internal Heater, rated at 15 Amps 120 Volts AC, 1 Nema plug. Dual Massage System combines Hydro & Air System to provide a truly luxurious bathing experience. Enjoy the luxury of bathing once again, simple, safe, comfortable and convenient with a walk-in tub from Meditub. There is no straining or struggling to get in or out of the tub when you own a walk-in bathtub. Makes warm baths or soothing showers accessible to people who thought they’d never enjoy the luxury on their own again. The walk-in tub door, low-entry step (5 in. ), Built-in Grab Rail and slip resistant tub floor are just a few of the features that make independent bathing secure in a Meditub. Built-in chair-height seat allows you to conveniently experience a comfortable, full body soak without the struggles of getting up and down. Available in a left or right drain model.